8 Minute from the President’s Cup. While the world obsessed about alleged abusive riding by Shelley Browning in the US and Bernhard Maier in Austria, a proven endurance horse abuse case was quietly adjudicated by the FEI last week. In that disgraceful episode from a 120km ride at Sakhir, Bahrain on February 8, 2014, grooms leapt from the accompanying vehicle and ran onto the field of play, one of them whacking the tiring leader Tarabic Carl with a hand-held instrument. I asked for the FEI’s integrity people to enhance the images in order to identify the gadget, but recall being fobbed off, to the effect that fantasy procedures you see on NCIS can’t be done in real life. Hmm. Anyway, our protest was upheld, and Tarabic Carl’s rider Sheikh Mohammed bin Mubarak al Khalifa, then 20, was disqualified. In his defence, the Sheikh said his grooms acted on their own initiative. But video footage (see link above) showed him hailing his crew car in a way that hardly suggested he wanted it to back off. Then at his very next FEI ride, Sheikh Mohammed was yellow-carded again for abusing another horse and thus served an automatic two-month suspension. I did hope the Tarabic Carl case would encourage more people to lodge protests about horrid things the ground jury has overlooked; abuse is the one protest available to everyman and is not time-limited. Goodness knows we see enough horses being struck with reins as long as fishing lines on livestreams from the UAE, Bahrain, Qatar and elsewhere. However, while two successful abuse protests have since been lodged in jumping, nothing more happened in endurance till January 2017, when an unidentified spectator sent a video of Australian-bred veteran Happy Jack being whipped by 22-year-old Khaled Ebrahim Khalil Khairi. This was also at Sakhir. Khairi said he had never before abused any horse on-trail or in training. He apologised and reassured it would not to happen again. Anyway, guess who owns Happy Jack (and later a won on him himself): yes, Sheikh Mohammed bin Mubarak al Khalifa of Tarabic Carl infamy. Was this another unfortunate case of his stable staff colluding to mistreat a horse without the boss’s permission? Quite a coincidence that the only two endurance abuse protests in FEI history involve people who are connected. Just to square that unfortunate circle, the FEI’s vice-president is Sheikh Khalid Bin Abdulla Al Khalifa of Bahrain, chair of FEI Group VII (Middle East). Just about every second person in Bahrain is called Al Khalifa and there are hundreds of Sheikhs, so it of course doesn’t mean Sheikh Khalid is closely related to or in any way personally responsible for young Sheikh Mohammed. But what are the chances of these reported offences being the only ones ever in Bahrain? 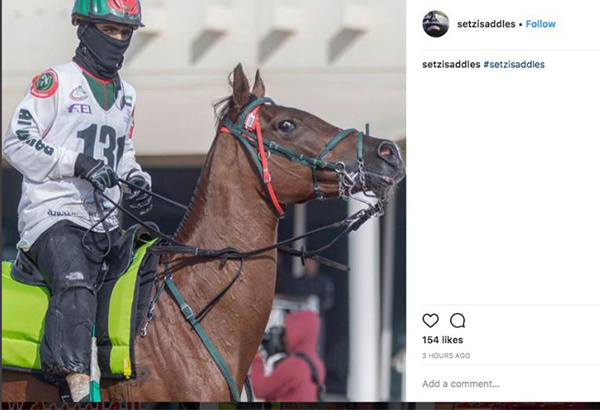 Here surely is the watershed moment for Sheikh Khalid to take an open, public stance against abuse (a stance so obviously missing over the border in Dubai and at Al Wathba) and insist Bahrain ground juries start paying attention and riders obey the rules. Meanwhile, there is something seriously wrong with anti-doping rules that allow a horse with recent steroids positives to continue competing and win a major ride when, quite likely, still under the influence. We are again talking about poor little 8 Minute from Al Wathba Stables, winner of the uber-rich President’s Cup CEI 160 km on February 10th. 8 Minute first made news in September at the young riders world championship in Verona, Italy, over the Mystery of the Airbrushed Bloody Feet. While the judges denied seeing blood, 8 Minute was vetted out for lameness so obvious the officials should themselves be reprimanded for prolonging her discomfort in the jog. Luckily, despite the serial showing of blind-eyes at Verona (a UAE-sponsored event where a well-circulated video of another young rider bashing a horse with a bottle at a crew point also went unpunished) someone had the gumption to sample 8 Minute. In due course, 8 Minute tested positive to three steroids Nandrolone, Stanozolol and 5AESTRANE-3B,17A-DIOL. Her rider in Verona, Khalifa Ali Khalfan Al Jahouri, 18, was thus provisionally suspended. The FEI could have made 8 Minute’s trainer Ali Khalfan Al Jahouri snr an Additional Person Responsible. However, he wasn’t provisionally suspended till two other horses in his “care” tested positive to banned diuretic Trometamol in December. What does suspending trainers mean, though? Diddly, that’s what. It would have an impact if all horses in the trainer’s barn were suspended too. But I’d wager it has been business as usual behind the scenes, and easy enough to name another bod as trainer paperwork. Trainer bans are only half-heartedly enforced, anyway. When banned trainer-rider Ali Al Muhairi (a record four-year suspension for steroids) was repeatedly spotted on the field of play, that breach sat three years in the FEI “pending” case file. 8 Minute started a 1* on November 25th with Al Jahouri jnr, before the Verona positive was notified in early December. 8 Minute herself was handed a two-month suspension – not to “punish” the poor animal, obviously, but to allow illegal medications to be expelled before the horse competed again. 8 Minute must have remained in work for on February 3rd she started under a stable rider in a CEI 120km, retiring after the first loop, thereby avoiding a long compulsory rest period. A week later, she won the world’s richest race – the President’s Cup CEI 160km – with a final loop speed of 32.6 km, under yet another new pilot, Rashed Hamoud Humaid al Janaibi. Vets tell me anyone with any sense would allow at least 60 days for steroids to disappear from the system but there doesn’t seem to be a lot of sense in the Al Jahouri barn. It was still being careless about horse meds in late December: but then again, why stress about being tested? The level of sampling in UAE endurance rides is still laughably minute. So aside from welfare issues, 8 Minute’s participation in the President’s Cup condones chemical-enhanced horses, dragging the desert sport into further disrepute – if it were possible, of course, to sink any lower than it already has. Finally, here’s a snap of 8 Minute from the President’s Cup (posted by saddle-maker Setzi, but apparently now deleted). Not exactly a picture of joy. Observe the extreme bitting – all perfectly legal under the FEI’s vague rules for endurance tack while a tool for further abuse. And what is that flapping strap attached to the reins? Which brings us back to Happy Jack and the ever-present need for general observers to do the officials’ job for them. Up for lodging a formal protest, anyone?